Other Antarctic Awards – W.A.P. 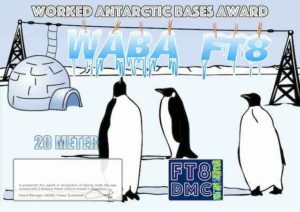 In recognition of international two-way FT8 amateur radio communication, the FT8 Digital Mode Club (FT8-DMC) issues a Worked Antarctic Bases Award certificates to amateur radio stations worldwide. Qualification for the FT8 WABA award is based on an examination by the FT8 WABA Award Manager, from QSOs that the applicant has bmade with minimum 3 different amateur radio stations from Antarctica. All contacts must be made from the same country. Band endorsements for 6, 10, 12, 15, 17, 20, 30, 40, 80 and 160m available. Enjoy it as much as we do! Registration is not a requirement to browse through the site, all here is “freely surfing”. Feel free to download pics, tables, QSLs, Award rules and WAP WACA & WAP WADA Directories; everything published on here is for you. To make comments to various pages and events on the site, or sending suggestion, just drop an e-mail.